​​ DALLAS-FORT WORTH – The North Texas industrial market absorbed 3,989,307 sf in first quarter 2018, according to JLL’s DFW Industrial Insight and Statistics 1Q 2018 reports. In 1Q 2018, 3,932,701 sf of industrial space came online, 31,000 sf for manufacturing and 3,901,701 sf for warehouse and distribution. Within DFW, the South Dallas and North Fort Worth submarkets are hotspots which account for more than half of the warehouse and distribution space under construction. However, leasing activity was strongest in the centrally-located Great Southwest/Arlington and DFW Airport submarkets in 1Q 2018. 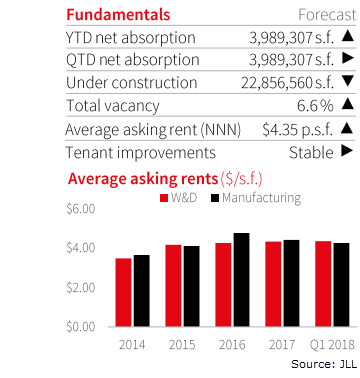 Also check out JLL's Office Insight and Statistics 1Q 2018 reports.